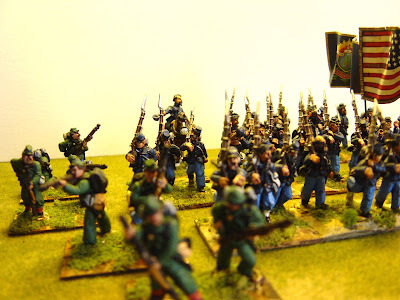 One of my background projects has been the American Civil War. 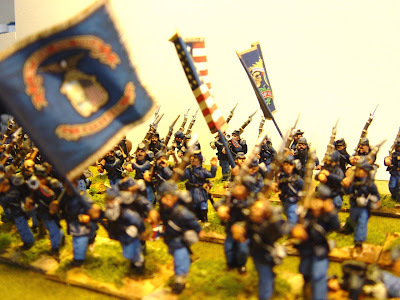 I'm somewhat limited in source material so I've created a fictional order-of-battle for the Union 11th Corps. The first Division (Barlow's) is finished and the three pictures above are of one of the two brigades - namely Colonel Gilsa's. I am planning to use computer rules so the basing system is mine. Each base is 1.5 inches x 1.25 inches. The figure scale is 1:33. Lastly, I know that some of the regimental numbers I have chosen might not have existed but such, in my view, is artistic licence. All the figures are, by the way, Sash & Saber, and are to be highly recommended.